Excellent quality indoor cricket nets tensioned cage for gyms and indoor facilities. Custom made to any size that is required. Super fast turnaround. Indoor batting nets custom made to any specification. 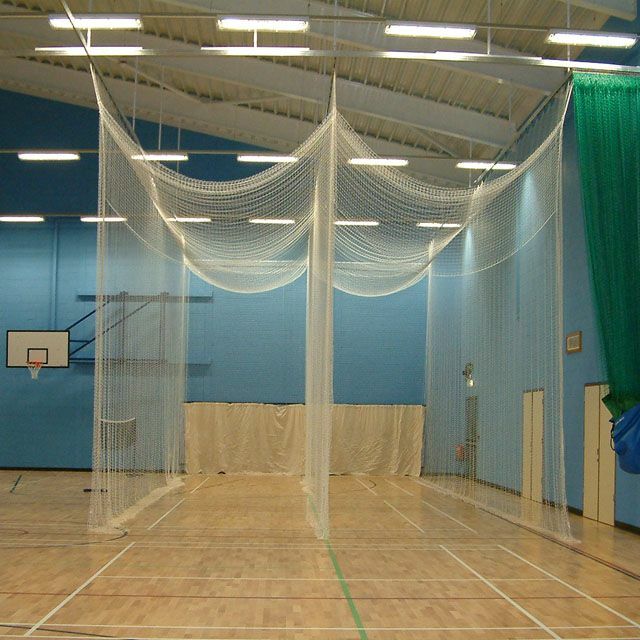 Flame retardant indoor cricket nets with canvas screens. From little to large, these indoor cricket nets tensioned cage could be made to whichever size you want. Regular service and maintenance will maximise the life expectancy of your sports netting. Keeping nets in top condition is not only important from a Health and safety aspect. but will increase user satisfaction and help attract new custom. Your custom made indoor cricket nets tensioned cage are made from the finest materials and reduce the risk of damage being cost by fire. Our engineer could help you design your own indoor cricket nets tensioned cage according to your requests. The accessories are also available, we have an experienced installation team to provide finished goods for you. All of these have helped us establish ourselves as leading nets manufacturer in China and our aim is to maintain this through providing quality goods and satisfaction to our customers.